Laura Prepon (born March 7, 1980) is an American actress. 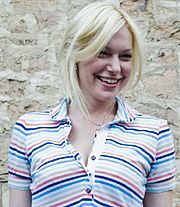 She is best known for her roles as Donna Pinciotti on the Fox television series That '70s Show and as Hannah Daniels on the ABC television series October Road. She plays Alex in Orange Is the New Black. Laura Prepon Facts for Kids. Kiddle Encyclopedia.